Cloncurry Shire Council had been issued with an Environmental Protection Order to desist from sewage releases to the environment. Council was subsequently issued with an order to prepare a Sewerage Master Plan and an Environmental Evaluation Report for its sewage treatment plant and effluent irrigation. Hunter H2O was engaged to prepare the Master Plan and the Environmental Evaluation Report. Development of realistic cost estimates and implementation timelines for the project. Cloncurry Shire Council has limited financial capacity and has difficulty attracting and retaining staff to operate complex systems. The successful implementation and long term operation of a sustainable sewerage treatment and effluent irrigation system also required recognition that funding of ongoing operations and maintenance activities was necessary. The preferred treatment option included retention of key existing infrastructure elements (facultative lagoons), modifications (addition of dissolved air flotation) to allow other existing infrastructure (filters and UV) to be used successfully and capacity (addition of anaerobic lagoons) and operational (package inlet works) improvements. These works were selected to minimise costly on-site construction while providing a robust, simple to operate solution. The preferred effluent irrigation system included additional effluent storage, delivery pumps and pipelines supplying centre pivot irrigation in the centre of the race course. Centre pivot irrigation reduced daily operational demands but provided the flexibility e.g. variable irrigation rates to respond to the challenges presented by sodic soils in a very harsh climatic setting. Advice was provided to ensure specialist irrigation design and agronomist inputs were incorporated into the system. The scheme elements were staged so that expansion from the current load of 2,800EP to 4,000EP could be achieved incrementally. The effluent irrigation scheme could be expanded from the initial STP environs and lawn cemetery to the race course and golf course and beyond that to the recreation reserve thereby providing greater community amenity from the reuse of the effluent. The Environmental Evaluation Report was accepted by the regulator providing an environmental framework for Council to proceed with the implementation of a suitable scheme. 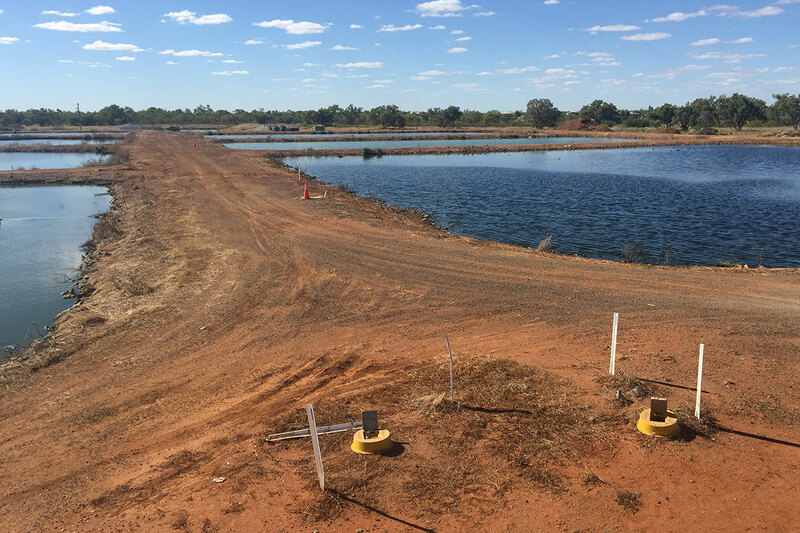 Cloncurry Shire Council used the Sewerage Master Plan and Environmental Evaluation Report to seek grant funding support for the project. The Council was able to secure funding from several sources making the scheme much more affordable for the local community. Hunter H2O supported Council in pursuing funding for the scheme.